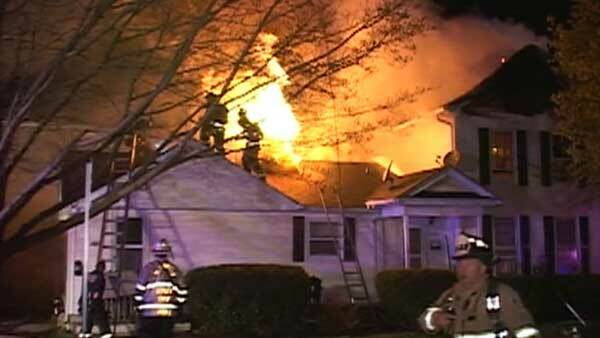 CHICAGO (WLS) -- A three-unit home in southwest suburban Plainfield caught fire overnight. A fire official said it may be a "total loss." Firefighters responded to the two-story building near Ottawa Street and the Fox River around 1:30 a.m. Thursday. Flames shot through the roof as crews tried to vent it. The fire was out by around 2:40 a.m. The residents on the first floor made it out without assistance. First responders went into the home looking for a resident on the second floor, but learned that person also made it out unharmed. One woman was taken away from the scene in an ambulance. Megan Luster, a neighbor, happened to be driving by when the blaze began. "I'm terrified for my friend. She has everything in there. She didn't grab a thing. She ran. She doesn't have her phone. She doesn't have her money. She doesn't have her clothes. She doesn't have her food. She doesn't have her bag. I'm just worried for my friend," Luster said. Residents waited to see if any of their property was salvageable. But Plainfield Fire Protection District Chief Dave Riddle said later that the structure may require a compete teardown. "At this point now I'd say (the home) may be a total loss," Plainfield Fire Protection District Chief Dave Riddle said. Investigators are trying to find out how the fire started.